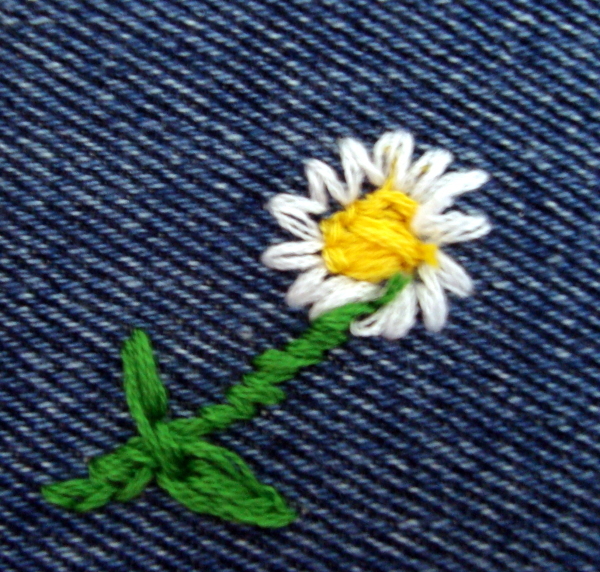 First, I would like to thank Clover and the UKQU for giving me the privilege of testing the Clover Embroidery Stitching Tool product. I must also apologise for the delay in writing this review. There are several reasons for this. Recovering from an operation took it out of me more than I realised. Secondly, had I written the review at first it would mainly have been very negative, I prefer to give a balanced review so I played with the product some more, and finally, I was hoping to finish the project I was doing. However, if I had waited until finished, this review might still be in progress this time next year. At the date of writing this review, the product was available via an online seller for £8.59, and all prices within this review are from the same online site. The needle says refillable, to me this would imply that the pack contains more than one needle. 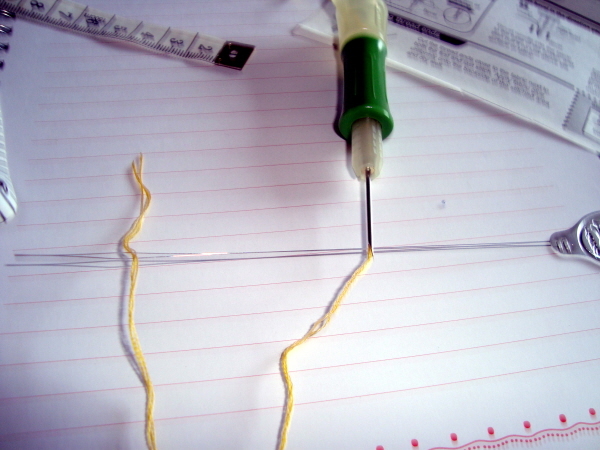 However, this is not the case, but it does allow you to purchase extra size needles for different thickness of yarns. You can purchase a 6 ply for £5.50 and a 1 ply for £4.91. The packet tells you that this product is suitable for dense fabric – medium/heavy weight – and goes on to give examples such as denim, poplin, oxford cotton, and felt etc. 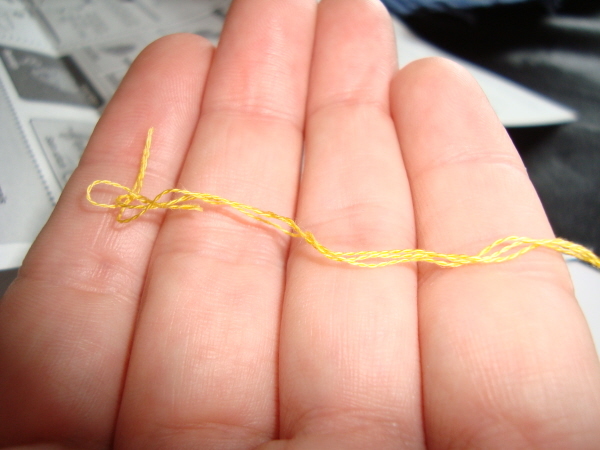 It also states the recommended thickness of thread required. In this case, no. 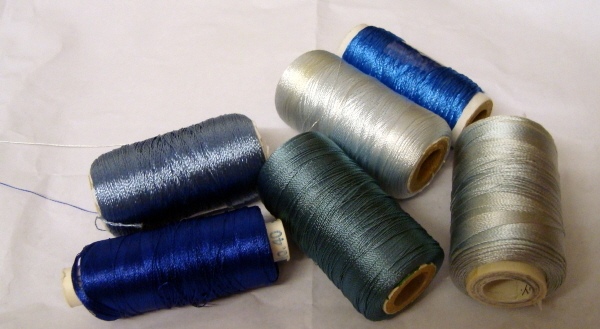 25 embroidery thread or 3 ply or no. 40 lace thread. 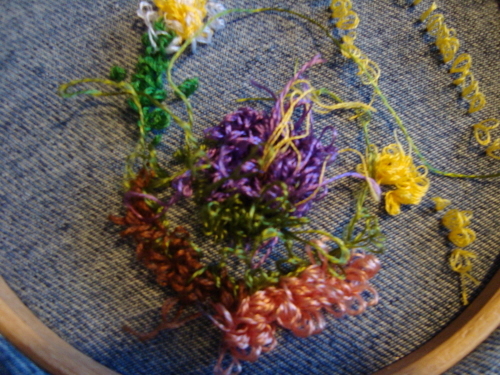 I did not have either so I broke my thread down into strands. I found this information an helpful addition. 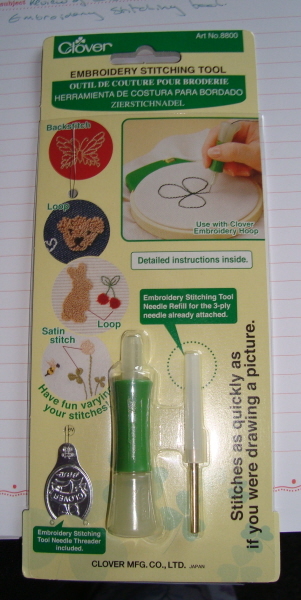 For this tool, you will also need an embroidery hoop, not included, although you can buy one online for less than £10 and the Clover 18 cm Embroidery Hoop is currently selling at £9.73. 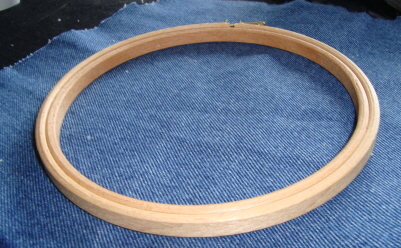 For my first test run, I will be using a wooden hoop. Due to the size of the print, the instructions were a little hard to follow and I would recommend reading them first before getting the tool ready. Follow each step carefully and slowly. Fixing the needle into the embroidery tool was easy; however, you had to pay close attention to lining up the needle with the tail of the tool. Threading the needle, you had to thread the needle threader through the needle shaft. 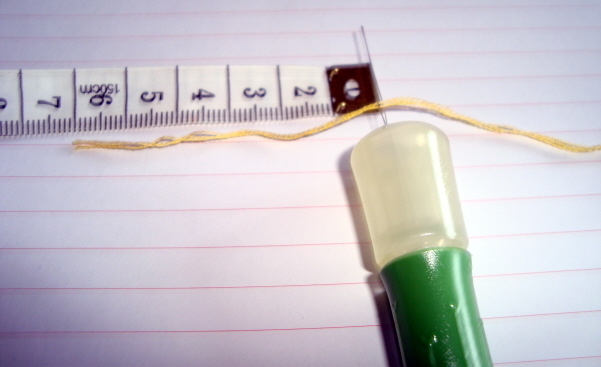 Pass the thread through the threader, the instructions say approximately 2 inches or 5 centimetres, see picture to gauge how long that is. 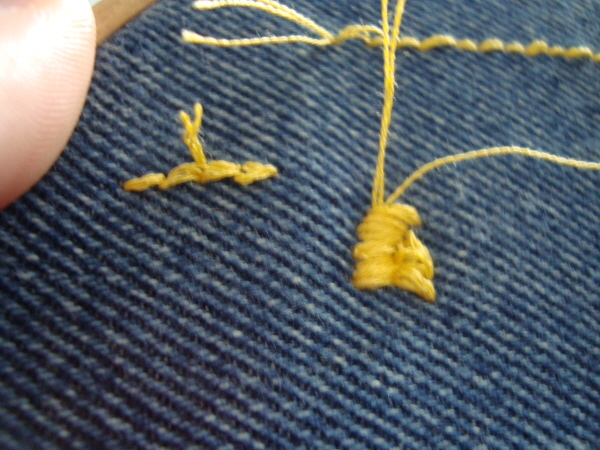 Then pull the threader slowly back out of the needle, and remove the thread from the threader. It was at this point I became concerned that I might break the threader, as the thread was not easy to remove from it so I had to be careful. 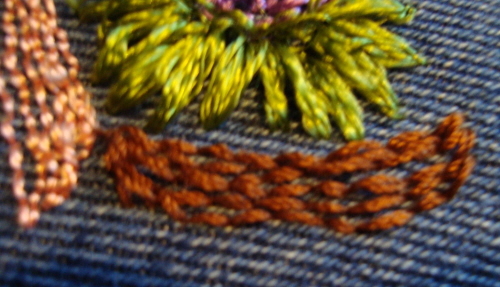 The next step is a little trickier as you need to pay close attention as to which way round the thread will be coming out. 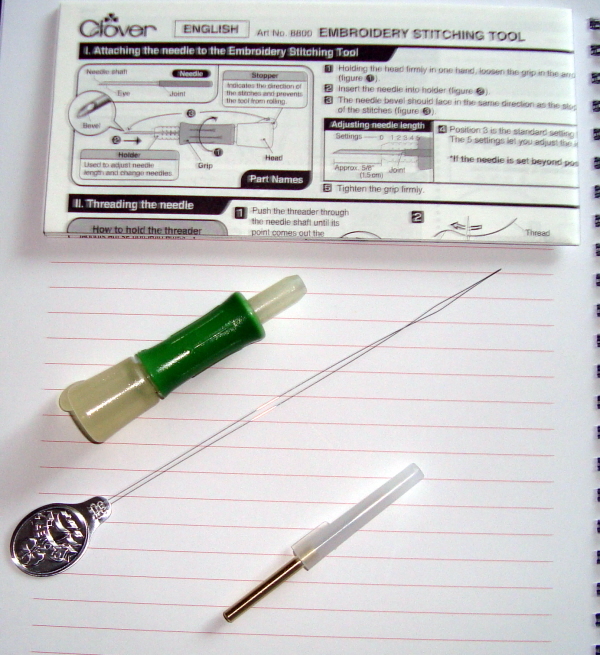 Again use the threader and this time pass through the eye of the needle. Thread the threader and pull back through, the thread should hang over the point on the front of the needle. Again, my thread caught on the threader. This was a bit concerning, as I know with smaller needle threaders they break very easily and this made me wary of this one too. 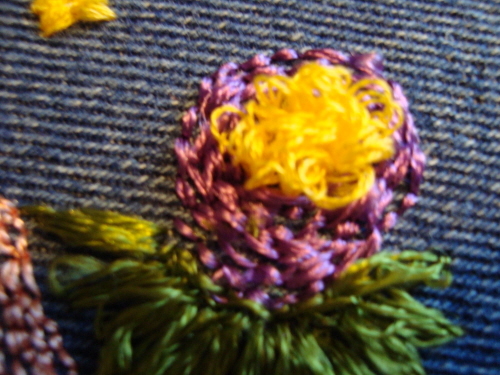 The stitch itself was easy to do and I could produce a row with ease. 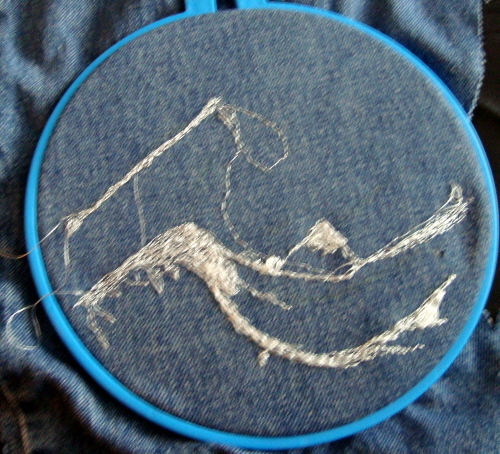 I tried two out of the three stitches that the instructions said I could make; backstitch and satin stitch. 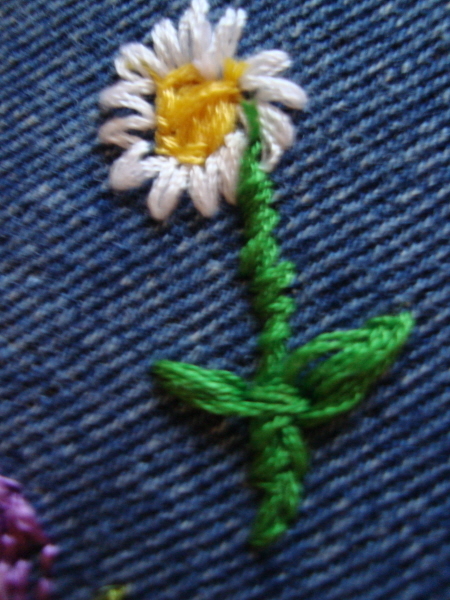 I also experimented with the tool and made stem stitch. It said you could also change the stitch length by the gauges on the embroidery tool body, but I did not see a great deal of difference in them. The one thing the instructions failed to mention was the length of thread recommended at the tail end of the tool. 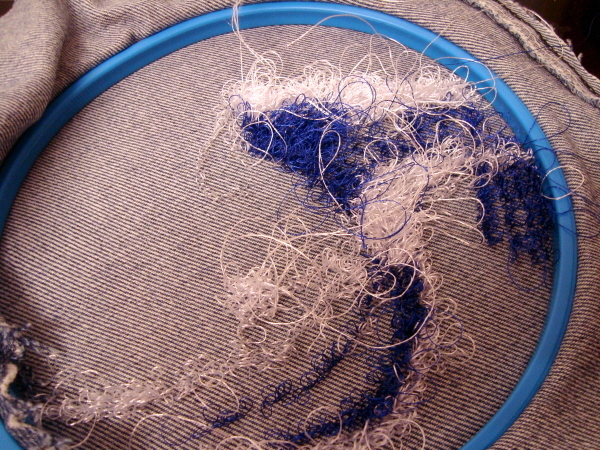 I was using longer than normal strands of embroidery thread, because the tool requires a larger amount of thread usage the strands did not last long and I was forever refilling, and with the fragile nature of the threader this put me off. I also did not like the loops on the back of the work. 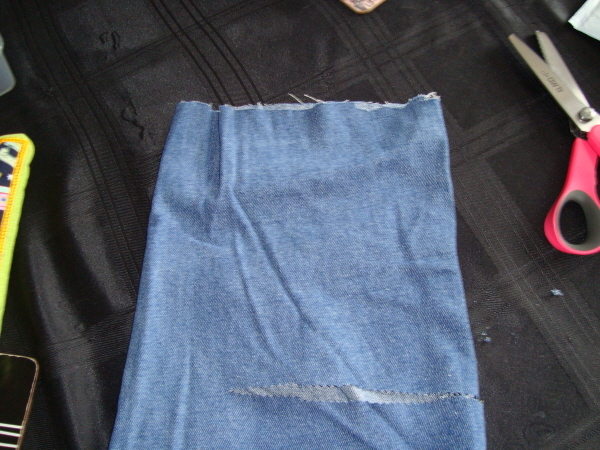 I found them to be too messy and they would need securing with either fabric glue or iron on interfacing. I have tried neither, because at this point I was a little disappointed with this tool. At this point for me, if I was to already sum this up it would read; the instructions were too small, the sewing was messy on the underside, and it used thread quicker than I could sew, and a very fine fiddly needle threader. There had to be more to this tool that just that, so I left it for a few days to think about it and process my notes, which so far were looking very negative. That did not sit well with me, as I like to give a balanced view, or give things equal chance. Two weeks later, I had an idea. Therefore, as the back was messy like free-motion embroidery can be when done on a sewing machine, it occurred to me that I could use it for free-motion sewing. Random placed stitches. 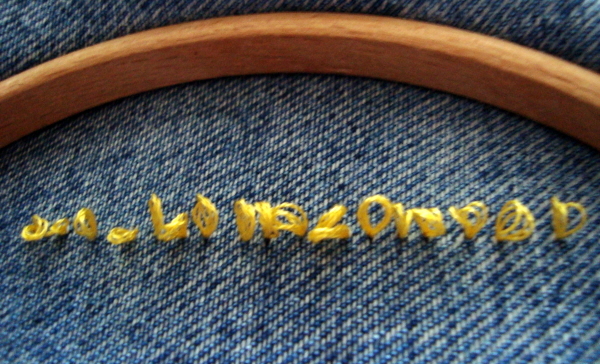 It also occurred to me that I had some very fine embroidery thread that might work for the project. Instead of cutting it up into strands, I left a tail from the tool, therefore keeping the thread spool in it until I needed to change thread. This was a game changer. It made using this tool so much easier, thus, removing my worry about the needle threader usage. My project was born. 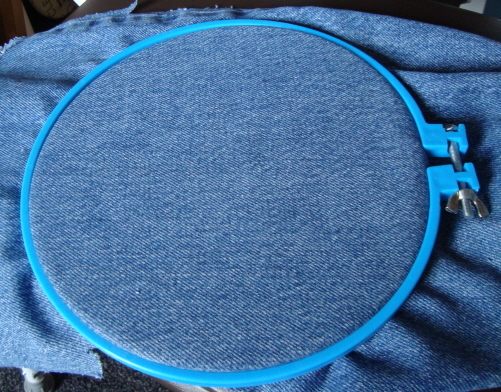 I hooped my fabric, again denim. 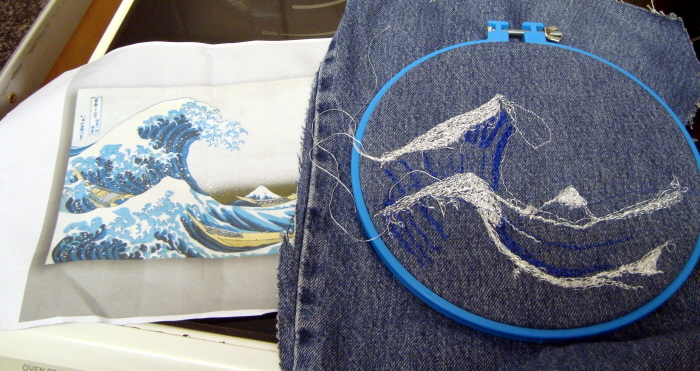 Found an image I wanted to copy, which was The Great Wave Off Kanagawa by Hokusai. I had hoped to finish it before submitting the review, but my recovery from the operation has taken longer than expected and effected me in ways I did not think it would. I have not been able to stay awake long to concentrate on much at all so this has fallen a bit behind. Rather than wait I am submitting this review with this project half done. I will continue to work on it and will be show casing it in my blog. • This product was easy to handle and had a nice grip with the handle not being too plastic or sticky feeling even when your hands got sweaty. 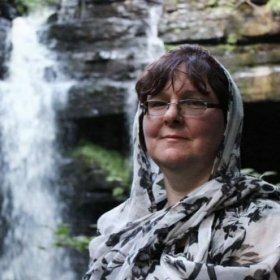 • Once I had mastered the thread issue – more user error pertaining to the length required– it was fun and easy to use. • I like the fact that you can change the needle grade to allow for a variety of threads and again their reasonably priced. • The font used in the instructions was on the small size, and I would have preferred they included about the length of thread, or the thread attached to the real. I did like the warning notice though. • The threader made me nervous, although it never broke. The cost to replace for a pack of two is reasonable. • I would not recommend for those with poor eyesight or lack of very fine motor skills due to the threading technique and threader. • Storing the ongoing project maybe an issue for some, as the lid on the needle is unsecured in placed while threaded. Would I buy this tool? I am not sure. I had considered it. If you want to have something fun to play with. I feel this maybe for you, for those that need it neat and perfect every time, then this maybe not for you. 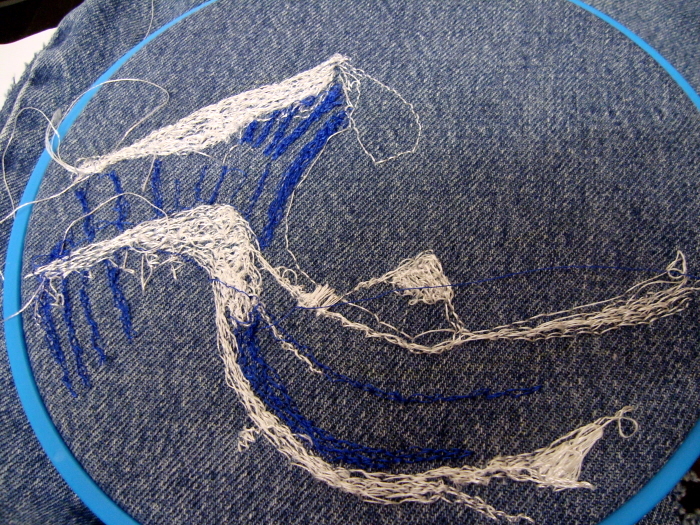 However, the more you use it the better at forming the stitches you will get. I have improved. The Cheap Procrastinator – I put the “P” in Procrastination. The Cheap Procrastinator – New you and away to sew! Milward Embroidery hoops: Product Review by Denise Inkson Aka The Cheap Procrastinator The Cheap Procrastinator: Hints and Tips from a Hospital Bed – A4 Presentation Portfolio Folder.